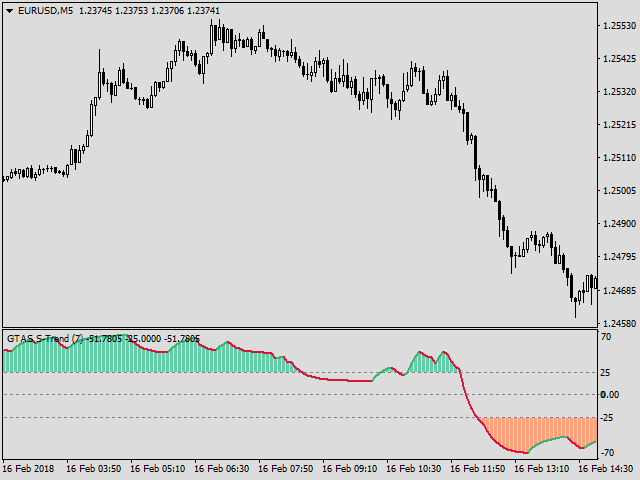 GTAS S-Trend is a momentum indicator that helps to determine trends using combination of MACD, RSI and moving averages. This indicator was created by Bernard Prats Desclaux, proprietary trader and ex-hedge fund manager, founder of E-Winvest. The indicator oscillates between -65 and +65 with a neutral zone between -25 and +25 around a 0 equilibrium line. S-Trend between -25 and +25 indicates congestion zones with a bullish bias between 0 and +25, and a bearish bias between 0 and -25. Beyond +25, the uptrend is affirmed. Below -25, prices are downtrend. The indicator is all the more interesting as it will be used over several units of time. Beyond + 25, and in the absence of a reversal pattern, it will simply be necessary to favor long trades. Below -25, and in the absence of a reversal pattern, it will be necessary to favor short trades, or profit taking if you are long. Between -25 and +25, it will be necessary to privilege the fast operations, with all the specificity of the congestion zones. In congestion zones, a confirmed break of the indicator beyond +25 or below -25, without the corresponding price action, is a sign of strength that can be used as a precursory break indicator. It is then used as a timing signal, one of the rare cases where confirmation by prices is not necessary because the risk-reward ratio becomes very interesting. Periods = 7 - the number of bars used to smooth the trend. This is one of the few lower thirds indicators that makes sense. It is not over reactive like most of them. It helps me to see if a reversal is likely to happen or if it's just a retracement depending upon momentum of the current trend. If you're like me an not exactly a fan of lower thirds indicators, this is a good option to try.